For one thing, remember not to get bogged down in guilt about the fact that your baby cries at night and is difficult to get to sleep. 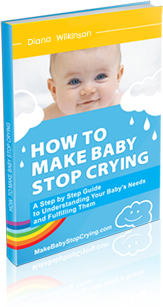 Many books have been written, all giving different advice about how to get baby to sleep. There are people that advocate many different things, from simply putting the baby down and letting him or her “cry it out” to a “co-sleeping” approach where the baby shares a bed with his or her parents. But the truth is that not every strategy works for every baby. A lot has to do with your baby’s temperament. Scientists believe that temperament is biological and innate. In other words, your baby is born with a certain personality and is going to react to different things in different ways than any other baby on the planet. If you think about it for a moment, that should make you feel pretty special—although it’s hard to remember that while your baby fusses for hours on end! For example, if your baby has strong emotional reactions to things, then she will probably get very upset if you try to put her down for bed when she’s not quite ready to go, and the screaming that results will be tough to listen to! Try making sure you have a routine for getting your baby to bed, and be willing to take a little longer to make sure she is truly relaxed and ready for sleep. If your baby is strong-willed and you try a strategy that involves letting him cry for a little bit before responding, be aware that it might take a little longer before your baby responds to that approach. In addition, some babies are just more sensitive than others to light, sound, or cold. In this case, try making sure conditions in his room are ideal—and possibly making some lifestyle changes in your home. If your child doesn’t really handle change well, then setting a bedtime routine and schedule, and being consistent with those things, will be very important. And if your baby is very energetic, then it might help you to make sure she gets plenty of exercise and activity during the day and some time to calm down at night before you put her into bed. How To Get A Baby To Sleep Through The Night?